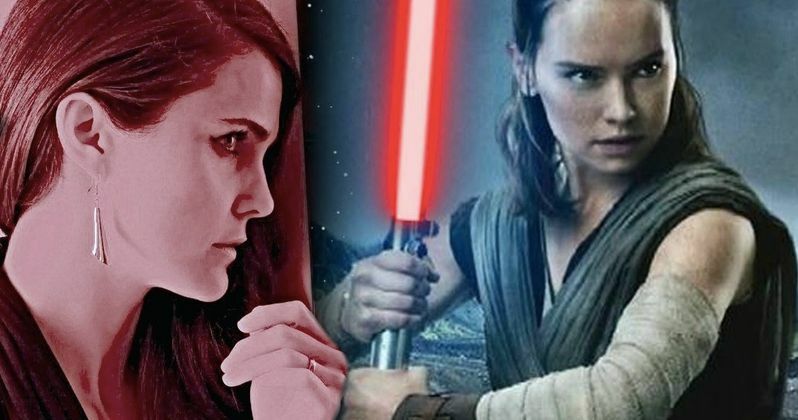 New Star Wars 9 Rumors Reveal Who Keri Russell Is Really Playing? A few new cast members have been added to Star Wars 9, but none have caused the kind of speculation that Keri Russell has. Her character remains a mystery, but many believe she is playing Rey's dirtbag mom, who got drunk with her lover and left the poor Force sensitive child on Jakku. Others have suggested that, with her wild red mane, she's going to rescue Mara Jade from the Legends stories and make her official canon. Some hold the belief that she is both of these things. But what do the latest Star Wars 9 rumors have to say about it? Quite a lot, actually. Star Wars 9 is in its third week of shooting under the watchful eye of director J.J. Abrams. His plan is to tie all three Star Wars trilogies and the handful of spin-offs into one big knot. This is the culmination of everything that has come before it. Rian Johnson disappointed quite a few fans when he revealed that Rey's parents weren't anyone special. Some liked that concept, others hated it, I personally want to see Rey's parents get their own Natural Born Killers type standalone where they drunkenly fling themselves across the galaxy, and Rey's mom has a one night stand with an old space pirate during one of her lover spats. I doubt that will ever come to fruition. But it appears that J.J. Abrams is going to try and rectify some of the damage done by The Last Jedi. Apparently we will be meeting Rey's real mom. The latest leak from the Lucasfilm camp claims that's the role Keri Russell is taking on. But there are a few Imperial entanglements. There is a scene that reportedly takes place between Keri Russell and Adam Driver, who is reprising his role as villain Kylo Ren. This scene will be shot in late September, and is expected to last for four days. There is some hard hitting action involved, which is why J.J. Abrams reportedly cast Russell. This scene in question will also involve some of the new ship set pieces as well. With walls covered in green screen, this moment in the film is being described as a great escape. And it will put Russell in the cockpit of a ship at one point. It has long been rumored that Russell's character will be directly involved with Supreme Leader Ren and General Hux. Though, these latest rumors do not make it clear whether Russell and Driver are playing enemies or allies. The idea here is that Kylo has contacted Rey's mother, and is now working with her to deceive Rey. It's believed that Kylo lied to Rey about who her parents really are. There is also the idea floating around that Kylo told the truth, but from a certain point of view. There seems to be a great deal of misinformation at play here. And it's possible that Kylo Ren was also deceived upon learning who Rey's true parents were. The plot supposedly has Kylo Ren learning the truth and location of Rey's mother. He finds her, imprisons her in a nod to Leia in A New Hope. The movie will reportedly pay homage to all the movies thus far, and we'll even get a wink back at The Force Awakens, with a scene of Rey's mom escaping the clutches of the First Order to seek out Rey on Jakku, just like Finn and Poe escaped the First Order in a Tie Fighter to flee to Jakku. So the basic premise is, Rey's mom is captures, held prisoner, possible tortured, and then escapes to seek out the daughter she left behind with that big greasy slice of ham known as Unkar Plutt. And it's even possible that in her travels, she meets Plutt's domestic partner Etinpi Skyvor, who has a score to settle with Rey. That last little part about Etinpi I made up. There's no way a giant pie-eating space creature with an affinity for Rose Tico would ever make it on screen. That's just too greasy. But the rest of this story is apparently true as Rey and her mother are set to have a reunion in Star Wars 9 that is spurred on by the man formerly known as Ben Solo. This latest bit of intel from the Star Wars 9 killing floor comes from The Express, who have not yet won any awards for being the most trustworthy name in news. So get out your little mini salt tabs you stole from McDonalds and swallow accordingly.